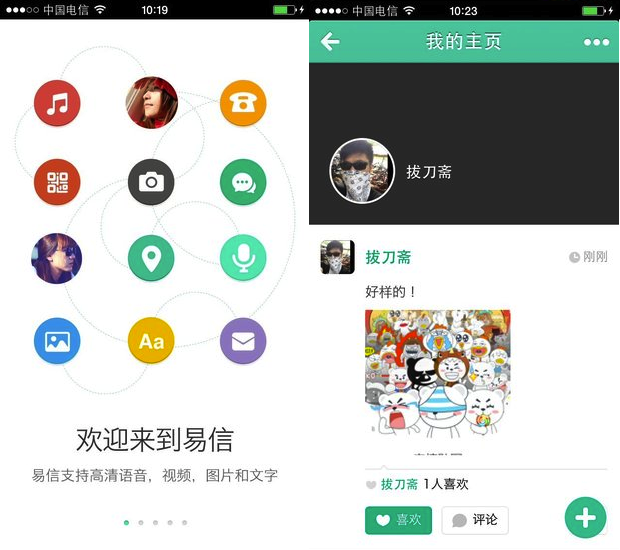 Chinese chat app WeChat is popular overseas, but facing a huge threat on home soil. Here’s why. Chinese operator China Telecom unveiled its mobile IM product in collaboration with Internet firm NetEase yesterday, called Yixin, in a move that literally declared war on reigning OTT messaging service WeChat (or what is known as Weixin in China). Tencent-owned WeChat is best known for being WhatsApp’s competitor — it was recently revealed that WeChat and Weixin hit a combined new high of 235.8 million monthly active users, and chalked up 100 million registered user accounts outside China. In comparison, WhatsApp recently revealed that it has surpassed 300 million monthly active users. With its overwhelming success, it is little wonder that WeChat has attracted the ire of Chinese telecoms for allegedly stealing users away from traditional SMS. A war of words emerged last Spring, with the Ministry of Industry and Information Technology, the government branch that oversees China’s state-owned telecom companies, at one point insisting that WeChat start imposing fees on its users. Well, that did not materialize. Instead, Chinese operators have started plotting different ways to counter the effects of WeChat. China Unicom chose to collaborate with Tencent to roll out a SIM card with an independent data package for WeChat and all of its related services called Weixin Woka. China Telecom, on the other hand, has taken an entirely different route. A comment left on my earlier report on China Telecom’s planned own messaging app noted (in Chinese) that with the huge presence of Weixin, it would be hard for Yixin to make any inroads. However, as of today Yixin has risen to become the third most-downloaded free app on Apple’s China App Store and has surpassed WeChat to become the top free app in the social networking category (as spotted first by TechWeb). 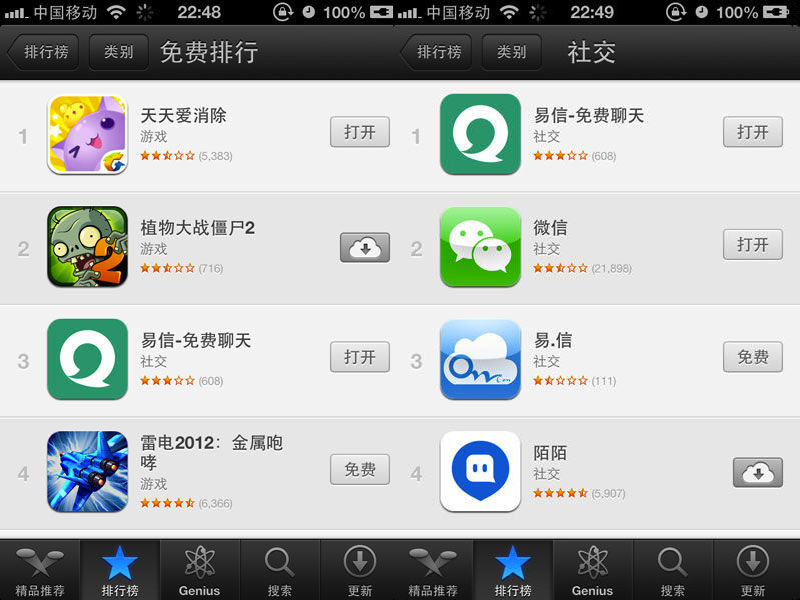 Yixin is number 3 among all the free apps (on the left) and number 1 in the social networking category (on the right). From what was noted before, Yixin basically has the same functions as current chat apps on the market. What then has attracted users to download it so rapidly in just its first day of launching? China Telecom has used its unique position as a telecoms provider to inject some differentiating factors into Yixin. One of them is that the other party does not need to have Yixin to receive messages — so Yixin is sort of like a hybrid between traditional SMS and OTT messaging, but all for free. Furthermore, Yixin has a voice function that is slightly more unique — basically, Yixin supports sending voice messages to landlines. This would be useful for communicating with the older-generation who may not be as tech-savvy. TechWeb also notes that Yixin supports group chats of up to 100 people, while WeChat caps the number at 40. Another appealing point: Yixin’s stickers are all free, unlike WeChat which charges for a large portion of its stickers. A benefit to tying up with NetEase, an Internet company behind popular Chinese web portal 163.com, is that there will be further collaboration — those with NetEase accounts can soon link up features such as their email accounts, news outlets and games to Yixin, though there isn’t a specific timeline yet. It has also been reported that those who sign up for China Telecom’s e-surfing plan will get 300MB of data free for the first month, while for the subsequent month through the end of this year, those who are active users of Yixin (sending at least five messages a month) on the e-surfing plan will get 60MB worth of monthly data for free. Depending on the demand and response, China Telecom will develop further promotions for data usage linked to Yixin in the future. It is pretty impressive that China Telecom has been able to distinguish Yixin from WeChat with some key features, which bodes well for the chat app’s future. On the other hand, WeChat has been going through some bad press for technical hiccups recently. Tencent went through some rather harsh criticism from WeChat users (and rival service Line) after it suffered a three-hour outage in late July, caused by routine work on a road which broke a network cable. Just as China Telecom launched Yixin yesterday, WeChat suffered a network failure last night that lasted nearly three hours, as reported by Sina Tech. The network failure saw users unable to log in to WeChat’s public platform and new users could not be updated into a friend’s list automatically. Tencent issued an official response via its account on rival service Sina Weibo, saying that there was a failure in the network equipment, affecting the sending and receiving of messages and registration of new accounts. This may or may not have boosted Yixin’s popularity in the Apple app store ranking so far, though it is worth noting that such inconveniences, if they occur too frequently, will definitely turn off users — and for a more reliable service, heading to an operator-owned Yixin seems to be a good bet. It remains to be seen if this momentum of interest in Yixin can be sustained — or if it is just the appeal of novelty for Chinese users. In any case, even if Yixin manages to tip WeChat off its pedestal in China, Tencent should not have to worry at all about Yixin ever becoming a real threat to WeChat overseas. It is not going to be easy for Yixin to ever break out of the Chinese market, considering that China Telecom is an operator that only caters to one market (though it is already a huge market and the company could do well staying within these boundaries). Furthermore, WeChat already has a huge headstart in its overseas reach. With football star Lionel Messi fronting its advertisements and its rapid pickup of users in overseas territories, WeChat’s aim is to threaten WhatsApp, while Yixin can only be content with taking away part of WeChat’s share and having Chinese users on its side. However, given that Onavo Insights published an infographic recently showing how the chat app landscape looks like worldwide among iPhone users in June 2013 — with WhatsApp the dominant one in 11 out of the 16 countries featured, while WeChat was only dominant in mainland China — WeChat might have to put its guard up against Yixin stealing part of its huge userbase in China if it wants to secure its position.